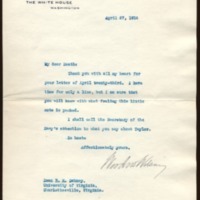 Woodrow Wilson writes to Richard Heath Dabney reagarding the appointment of a man named Taylor in the Navy. Thank you with all my heart for your letter of April twenty-third. I have time for only a line, but I am sure that you will know with what feeling this little note is packed. I shall call the Secretary of the Navy's attention to what you say about Taylor. Wilson, Woodrow, 1856-1924, “Woodrow Wilson to Richard Heath Dabney,” 1914 April 27, WWP20501, University of Virginia Woodrow Wilson Letters, Woodrow Wilson Presidential Library & Museum, Staunton, Virginia.